MIAMI (Sporting Alert) — The Miami Heat and the Golden State Warriors both picked up wins in the NBA on Sunday, Nov. 2. Klay Thompson scored 29 points on 11-of-22 shooting and Stephen Curry added 21 points, six assists, five rebounds and two steals and Golden State (3-0) beat the Portland Trail Blazers, 95-90 at Moda Center. Leandro Barbosa scored 13 points and Andrew Bogut collected 11 points and 12 rebounds for the Warriors, which took the lead at 91-90 with 0:08 on the clock when Thompson moved inside and hit a jumper with Portland’s Wesley Matthews all over him. “If I had a jumper I was going to shoot it and if he was on my hip I was going to try to get to the rim,” Thompson said. Curry then knocked down four consecutive free throws to seal the win for Golden State, who returns to action again on Wednesday night at home to the Los Angeles Clippers. LaMarcus Aldridge paced the Trail Blazers (1-2) with 26 points and 13 rebounds, but turned the ball over two times in the last six-seconds. Wesley Matthews scored 18 points, Robin Lopez added 12 points and 10 rebounds and Damian Lillard finished with 11 points, six boards and five assists for Portland, which went just 7-of-27 from long range in the defeat. Over at the AmericanAirlines Arena in Miami, Chris Bosh scored 21 points and pulled down 11 reounds and the Miami Heat beat the Toronto Raptors 107-102. Dwyane Wade added 19 points and also grabbed 11 rebounds and seven assists for Miami (3-0), which had 32 of the 48 total rebounds at the defensive end. Luol Deng finished with 18 points, Shawne Williams added 16 and Mario Chalmers contributed 12 off the bench for the Heat, who is the only unbeaten team in the Eastern Conference. DeMar DeRozan scored a game-high 30 points and picked Miami off on four occasions in a losing effort for Toronto (2-1). Kyle Lowry scored 22, Jonas Valanciunas chipped in with 14 points and eight boards and Greivis Vasquez got 12 points off the bench for the Raptors, who are 1-1 on the road. Miami out rebounded the Raptors 43-28. “At the defensive end, it’s from start to finish,” Raptors coach Dwane Casey said. “You don’t just guard for 23 seconds. Casey was disappointed to see Wade, a guard going in and getting so many rebounds. 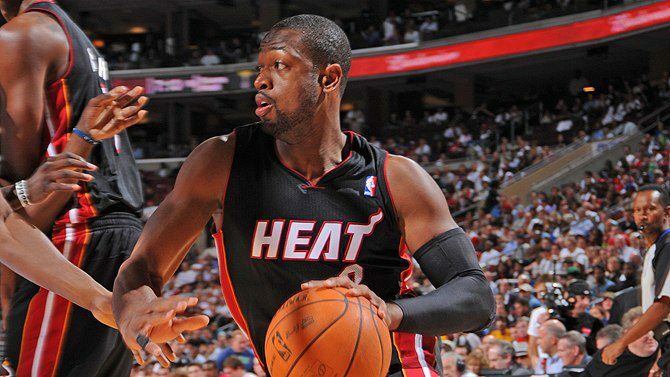 “It’s not like it was one of their big guys getting the rebound — it was (Wade),” he said. Elsewhere on Sunday, Carmelo Anthony 28 points on his way to surpassing 20,000 career-points, in the New York Knicks’ (2-1), 96-93 victory over the Charlotte Hornets 93 (1-2). The Clippers (2-1), who rested Jamal Crawford went down 98-92 to the Sacramento Kings (2-1).